implementation guidelines providing a detailed syllabus of the specific skills to be acquired by teachers within each skill set or module. Through the ongoing and effective use of technology in the schooling process, students have the opportunity to acquire important technology capabilities. The key individual in helping students develop those capabilities is the classroom teacher. The teacher is responsible for establishing the classroom environment and preparing the learning opportunities that facilitate students’ use of technology to learn, and communicate. Consequently, it is critical that all classroom teachers are prepared to provide their students with these opportunities. Both professional development programs for teachers currently in the classroom and programs for preparing future teachers should provide technology-rich experiences throughout all aspects of the training coaching and (professional learning). 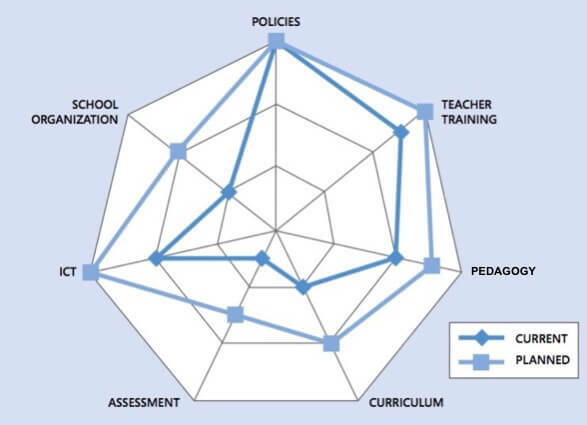 Standards and resources within UNESCO’s project “ICT Competency Standards for Teachers” (ICT-CST) provide guidelines for all teachers, specifically for planning teacher education programs and training offerings that will prepare them to play an essential role in producing technology- capable students. Today’s classroom teachers need to be prepared to provide technology-supported learning opportunities for their students. Being prepared to use technology and knowing how that technology can support student learning have become integral skills in every teacher’s professional repertoire. Teachers need to be prepared to empower students with the advantages technology can bring. Schools and classrooms, both real and virtual, must have teachers who are equipped with technology resources and skills and who can effectively teach the necessary subject matter content while incorporating technology concepts and skills. Interactive computer simulations, digital and open educational resources, and sophisticated data-gathering and analysis tools are only a few of the resources that enable teachers to provide previously unimaginable opportunities for conceptual understanding.